Now that I have a few months' worth of daily heart rate and running data available on Microsoft Health, I thought I would take a shallow dive into my numbers, purely for fun. The question I wanted to investigate is what impact running has on my heart health, as measured by my heart rate. So, I exported my data into an Excel spreadsheet and got to looking. The blue series is Average HR, the green series is Max HR, and the red series is Min HR. I displayed the equation for the red series so that you could see that the slope of the line is negative, i.e. that minimum heart rate falls as miles-per-day increases, unlike the other two series. First of all, simply correlating daily average heart rate to total miles run is somewhat misleading since, although we'd expect my heart rate to get lower the more I run, my heart rate obviously increases dramatically when I'm actually in the process of running. 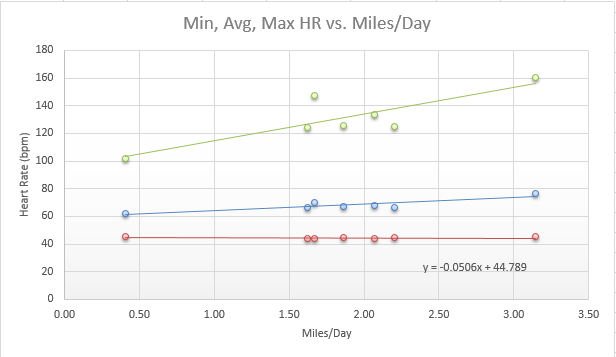 So, noting that average heart rate increases with miles run does not tell us very much. Second of all, some caveats apply to the miles/day numbers. Some months have more days than others, some months are only partially complete (since August is far from over, and since I did not start using my Band 2 until partway through February, etc.). So it's not a totally fair comparison, but it's close enough for casual purposes here. Third, the miles/day number is not an expression of how many miles I tend to run in one go, but rather the total number of miles logged in a month divided by the total number of days for which I have HR data for that month. So when I take a rest day, that brings down the average. On average, my runs tend to be between 3 and 6 miles, but I don't run every day, hence the numbers looking like they do. Note that if you do this at home, you'll want to use the harmonic mean to find your average heart rate per month, not the arithmetic mean. There are technical reasons for this, but if you're not a math geek, you can just remember the simple rule of thumb that we use the harmonic mean for rates, just because. Running appears to decrease resting HR. Running appears to increase max-HR in more than just a trivial way. That is, it really looks like running increases the heart's limits, not merely that running itself increases the heart rate. It should be interesting to watch this over time, as I experience months of more varied activity.